The lush environs in the tropical deciduous forests that surround Puerto Vallarta are home to a remarkably diverse number of exotic plants, blooming flowers, fruit-bearing trees, multi-colored birds, unusual mammals and unique reptiles. Our local naturalist guides are experts on the native flora and fauna. These bilingual guides enjoy sharing their knowledge of the local wildlife with vacationers. You'll be amazed by the brilliant array of blooming plants in this region, including rare varieties of wild Orchids and colorful Bougainvillea. Other exotic plants in the area include Chiltle, Brazilwood, Tampiciran, and Amapa. Much of the local plants have been utilized by the local population for eons. In small coastal hamlets such as Mismaloya and Yelapa, local craftsmen still carve Parotas into rustic canoes. Hardwoods such as Walnut, Cedar and Primavera are used for furniture manufacturing. Wild Fig trees and Vanilla vines are still harvested for local recipes. You'll even see Agave, the pointy plant used to make Tequila. The Maguey Plant is fermented to create Raicilla, one of the oldest known liquors on Earth. Puerto Vallarta WildlifeWell over four hundred individual species of birds call this region home at different times throughout the year. The tropical weather, deciduous forest environs, and pristine coastal habitat provide homes for year-round species and draw migratory birds to this region every winter. The colorful plumage and beautiful songs of this avian conglomeration provide entertainment for the eyes and ears of eco-tourists. Bird watchers may spot varieties such as Yellow-winged Caciques, Black-Throated Magpie Jays, Amazon Parrots, Tropical Kingbirds, Great Kiskadees, and Blue-footed Boobies. An array of distinctive mammalian species inhabit the verdant forests surrounding Puerto Vallarta including White Tailed Deer, Wild Boar, Armadillo, Badger, Coyote, Skunk and Rabbit. There are a variety of cats including the legendary Jaguar, Jaguarondi, Puma, Ocelots, and the smaller Margays. You may spot a coati mundi, a mischievous ring-tailed relative of the Raccoon. If you look around the lower branches of trees, you may spot the titular character from Tennessee Williams' play, The Night of the Iguana. 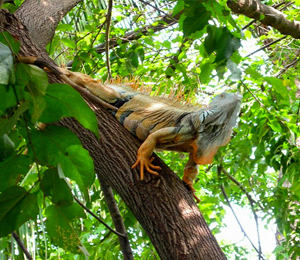 Two different varieties of Iguana call the jungles of Puerto Vallarta home, including the Green Iguana and the Spiny-Tailed Iguana. Beware of the venomous bite of the Mexican Beaded Lizard -- you'll recognize this relative of the Gila Monster by its signature bumpy black skin with white and yellow stripes.